The IDX feed is on your website. Your contact page is easy to find. The colors, font, and layout aren’t going to blind anyone. The design is mobile responsive so anyone can view it from any device. Basically, your real estate website looks great! Now, you’re ready to figure out what kind of content you should add. You have plenty of options for the kind of content you can include in your site, but the two most common options are blogs and videos, sometimes known as vlogs (video blogs). If you’re still not sure which direction to go in, take a look at how each option can work for you. An effective way to share information is through a blog. You may be more familiar with individuals who write about their personal lives. Blogs began as online journals, but these days, businesses have blogs in order to share industry, local, and company information. As a real estate agent, you can use a blog to answer common questions, discuss local market statistics, describe local neighborhoods, and share information about your community. Some people think they can’t have a blog because they don’t know how to write. First of all, you’re probably not as bad a writer as you think you are. Second, if you really have no interest in writing a blog but still want the content, you can always hire someone to write for you. You can have as little or as much control as you want over the content they create. Don’t think all blog content has to be text, either. Infographics, videos, and presentations can also be inserted into a blog on your website. The point is to create a space where you share content relevant to the people who visit your website. As with anything, there are pros and cons of choosing a blog based primarily on the written word. Like a blog, your video content can live on your website. You can also create a YouTube channel and build a base of followers. Videos, thanks to smartphones and online editing equipment are easier to make than ever before. Instead of writing down all your content, you can speak directly to the camera. If you’re just starting out, you don’t have to invest in a lot of expensive or fancy equipment, but there are some things to keep in mind. Use a tripod or stand to keep the camera steady. If you have someone help you, make sure they know to hold the camera steady. Check your background to make sure it looks professional. Record somewhere quiet without interruptions or background noise..
Look at the camera when you speak. Do test shots with your lighting, background, and the color of your clothes. Choose the wrong color combination and your skin may look unnatural. Prepare what you want to say ahead of time but don’t worry about memorizing a script. Talk to the camera like you would a customer or client. Give yourself time to record multiple times and start over. Even George Clooney needs multiple takes when he makes a movie. Record when you can take your time and aren’t in a rush to get it right in one shot. The end product of a good, informative video means that you have something that informs and educates viewers. Hopefully, they’ll also find you entertaining – in a good way. Pros: Videos can be uploaded on social media and posted to your blog, as well as YouTube; you don’t need expensive equipment to make a decent video; you can speak instead of write. You can also create both written content and videos. Write a blog post and then create a video based on the same content or keep the topics separate. Videos can be posted to your blog as a separate post, giving your more content for your website. 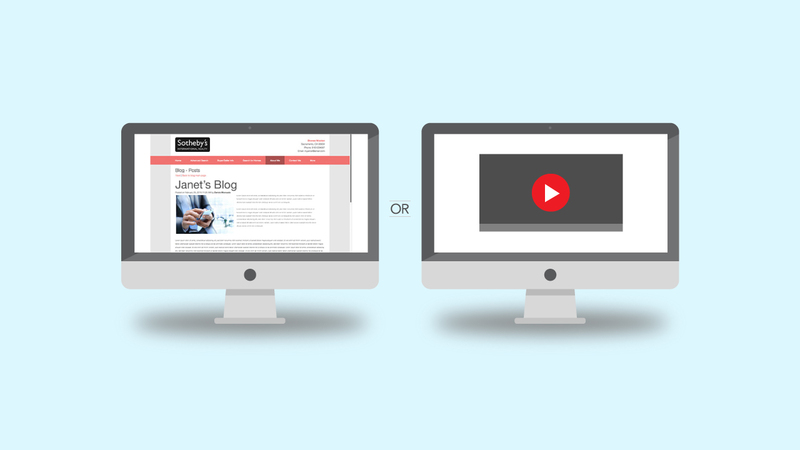 The choice between a blog or video (or both) is unique to you, your business, and your capabilities. Share blog posts to all your social media outlets: Facebook, Twitter, Pinterest, and others. At the end of the day, what you need is content that shares good information, educates visitors to your site, and gives people a reason to believe you’re the best real estate professional for them.